From California having 842,106 motorcycles registered as the highest to a low of 28,158 Bikes in Delaware. See 2016 stats on numbers of registered motorcycles here. Get us some fuel to reach them ! Over 8 million – a loyal, patriotic ‘niche’ market that take civic duties and responsibilities serious and cuts through the garbage and fake news . In some States, one in every 12 adult citizens owns a motorcycle. South Dakota, in 2014 had one out of 12; New Hampshire having 1 in every 17; and 1 of each of Iowa’s 18 citizens owning a motorcycle. See here for states ranked by highest motorcycle ownership. Everyone who rides a motorcycle does something else. We are your employers and employees. We are your neighbors. We are Fathers, Sons, Brothers, Mothers, Daughters and Sisters, and grandparents ! 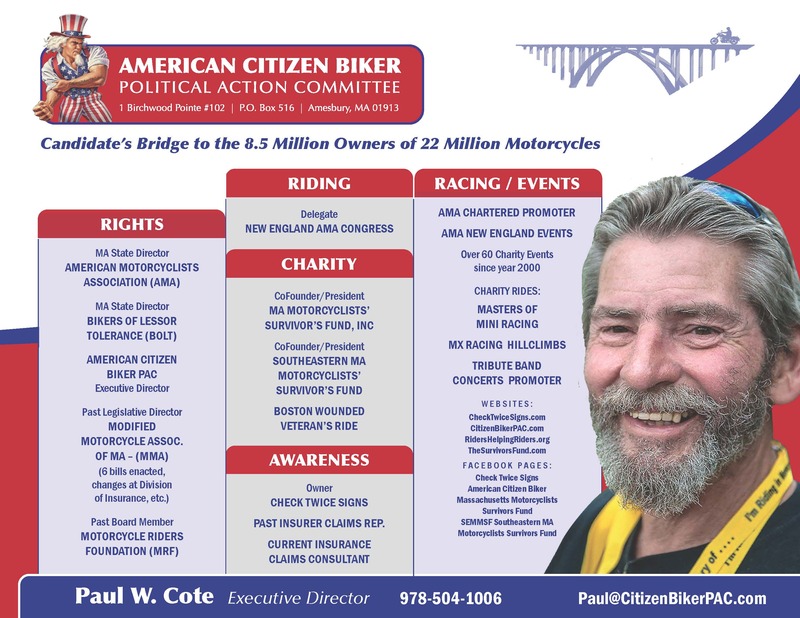 The American Motorcyclists Association (the ‘other’ AMA) last year reviewed / tracked over 21,000 pieces of legislation, having over 213,000 members, (93% male/7% female) who’s demographics show average age of 49 years and average household income $85,300, as of August 2018 ! See facts and figures from the AMA about our riding community. Help us ROAR for 2018 and 2020 !